Milton Keynes FC was officially established in 2004, taking the place oWimbledonon in the football league, but the seeds were actually sewn earlier than that. AFC Wimbledon were formed in 2002, so this seems an appropriate start date (though initial plans for the move were announced officially in 2001). There was a single season playing at Selhurst Park in front of sparse crowds - just 664 turned up for a League Cup game against Rotherham. They moved into the National Hockey Stadium early on in the 2003/04 season, finishing rock-bottom of Division 1 (now called The Championship) in their final season under the name of Wimbledon. Renamed in 2004, they would continue to struggle, now in League 1. Narrowly avoiding relegation in 2004/05, they would go down to League 2 in 2005/06. 2006/07 would see a 4th place finish in League 2 before they lost in the Playoffs to Shrewsbury Town. Their cup record was reasonable whilst at their temporary home, twice reaching the FA Cup 3rd Round and also the 4th Round under their old name. The League Cup 3rd Round was reached in 2006, the 5-0 defeat to Tottenham Hotspur producing the record attendance at the ground of 8,306. I made two visits to the National Hockey Stadium. My first visit was for a Berks & Bucks Cup game in March 2005. A young Wycombe side triumphed 2-1 on a night that I remember more for Wycombe fans singing than anything else - manager John Gorman asking us to stop swearing - as you can see from the report below. That should have been my only visit, but I did go once more. I was in the midst of a 7-year spell where I didn't miss a game home or away and so I didn't want to miss the game. Nowadays I'd be more principled and boycott the game, but I got what I deserved as we lost 3-1 in a disappointing performance. BLUES boss John Gorman ordered his team's fans to clean up their language during Tuesday Berks and Bucks Cup derby at MK Dons. The gaffer was so disgusted by the swearing from his side's small knot of supporters at the National Hockey Stadium that he stood up in the directors' box and called on them to curb it. Then, during the interval, one of his directors went into the crowd to repeat his instructions to cool it. Tempers flared among the small crowd with Wanderers fans angry that the Dons, formerly known as FA Cup winners Wimbledon, have been allowed to relocate to Milton Keynes. Some Blues fans even went as far as boycotting the game against a team they have dubbed The Franchise Club. 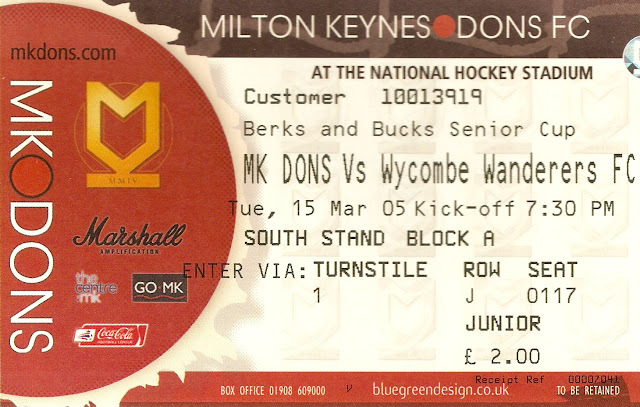 THE NATIONAL HOCKEY STADIUM was only meant to be a temporary home to Milton Keynes, whilst their current venue was built. Originally built in 1995 as a base for the England Hockey Team, there were two side stands - one large covered one with a capacity of around 3,200 and an uncovered one with an 800 capacity (this was later the away end. When Milton Keynes (under the name of Wimbledon) moved there in 2003, there was a stand built behind each goal, each with a capacity of 2,500 - one covered and one uncovered. 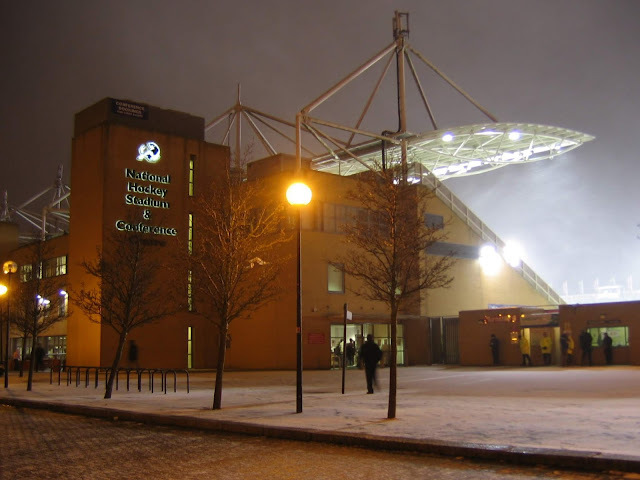 Hockey was moved elsewhere when the football moved in, so with no tenant once Stadium MK was built the ground was closed in 2007 and demolished in 2010. The National Rail headquarters is now based on the land.